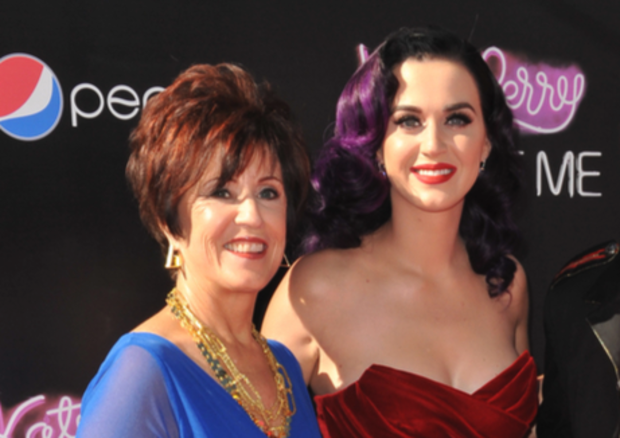 Katy Perry is seen with her mother Mary in this file photo. NEAR WEST SIDE — Katy Perry's mother joined her on stage at the United Center Wednesday night shortly before the pop star performed the song the singer said her mom "wish[ed] I never sang." The visit came on Perry's 33rd birthday. In a video posted on YouTube, Perry talks a bit about Chicago (her mother, Mary, asks her if she knew that the Chicago River runs backwards) before Perry starts leading her off the stage. "You have to go off the stage now because I have to sing that song you wish I never sang...and that you pray for me about?" says Perry. Replies her mom: "Oh, you mean the one that dad likes?" Says the singer: "Why does dad like it?" "Because he kissed me and he liked it," says Mary Perry. Perry's 2008 song "I Kissed A Girl" helped launch the former gospel singer's career as a pop star. Perry's mother and father, Maurice, are Pentecostal ministers.